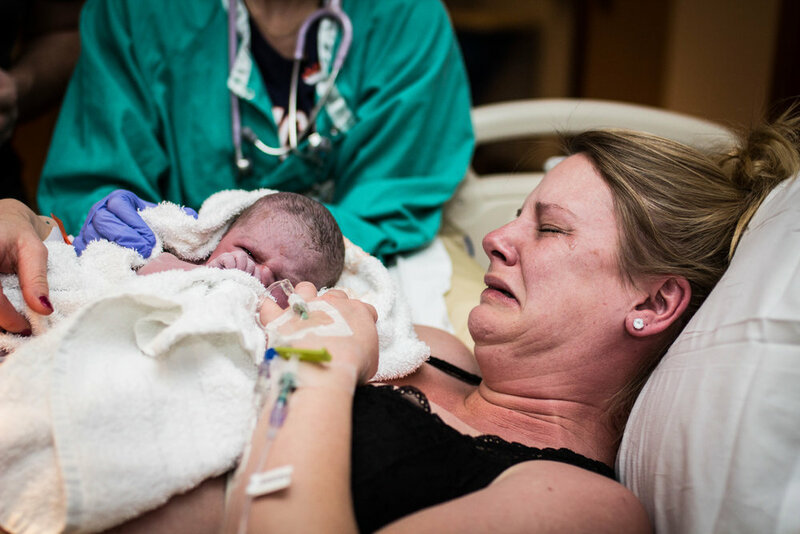 In birth photography, I’ve come to learn that every moment matters, but the one Mom wants captured the most is what we call, “Moment of Birth.” It’s the split second moment after the hours (not always) spent in labor, after the time spent listening to your doctors and nurses tell of the progress or lack thereof that you’re making. It comes after the tremendous worry and nervousness you get while getting your epidural (“DON’T MOVE!”). And it comes right after the pushing, ring of fire, “He’s got a lot of hair!” and in the case of belly births, right after you hear the most precious words, “He’s here!”. [And even though I’ve yet to photograph an adoption, I can only imagine the moment the judge declares you officially family is equally elating] Then it happens. One minute you’re putting every ounce of strength into working your baby out and the next, only seconds between, you feel the most tremendous heart swelling feeling as your baby is lifted up and into your arms and onto your chest. Then comes the cry. The baby's I mean. And then your own. Unforgettable. And then, over the next 3 months, you spend every hour becoming a mother. Of course, you were a mother the moment you saw a positive. But in those three months, motherhood suddenly becomes something you blend into (did I put that right? It's so hard to explain!). Caffeine. You can never have enough (at least that’s how I feel as I write this). Messy buns. And not the cute kind. I find myself wanting to apologize to myself for this consistent hairstyle of mine. But no more. I own it. For the next few years anyway. Cold dinner. It really is ok. As long as I eat, at this point. Lower back aches. From the baby-wearing, horsey back rides, vacuuming, and crawling into small hidden places with your toddler. Target. They have successfully marketed to every mother. That’s why. Parks. This may be a Colorado thing, but I now consider myself an expert at half the parks in Denver. And my son has a nickname for every one. Kisses. From the Moment they’re born until forever, I’ve always been the mother to smother my child in kisses. Not sure it’s good for them, but you can’t stop me! Motherhood is “What do you need? What do you want? Am I doing this right? Say that again, I can’t understand you. Yes! You’re finally asleep. You can wake up now. I love you more than anything. Can you just be still for a second? Stooooooop. I’ve created a monster. You’re perfect. Oh my goodness stop growing! Hey look internet world! My child is huge!”...I could go on. Motherhood is a conglomeration of every emotion you ever thought you could feel, utter pain and utter elation not excluded. And yet, even still, I find myself living for the moment. No, not the Moment of Birth, but analogically yes, THAT moment. The moment after all the work is done and the dishes are put away and my kids are asleep. And the sheer irony? It’s after the longest days and longest nights that my husband and I start talking about our kids and their perfection. Because just like the Moment of Birth, every ounce of pain, every contraction, every bit of nervousness, every breakdown, it all fades. In those cathartic “Moments” you realize how strong you really are. How far you’ve come. You suddenly become aware of how much you’re capable of and how important every single moment truly is. And this is what we birth photographers call, a Storyboard. From start to finish, all of the moments are significant and tell your story.